When Gina Leary-Almeida decided to pursue her Bachelor’s degree in Liberal Studies at PC’s School of Continuing Education, she was a single mother working the night shift as a Certified Nursing Assistant to make ends meet. She wasn’t sure she could do it, or that she’d be good at the course work. But she persevered and became the first in her family to earn a college degree in 2012. Five years later, not only is she the owner of two businesses, she’s using those businesses to pass on her passion for success and belief in one’s self to other women. 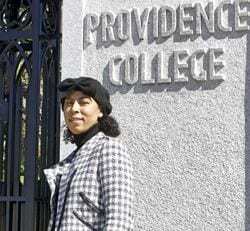 “What really drove me to make the decision to attend PC was their motto – ‘transform yourself, transform society’ – and that’s just what I’m trying to do,” Leary-Almeida says. A native of Providence, she opened her first business with her husband in the city just two years after graduating. Almeida Landscaping and Masonry builds beautiful landscaping and stone walls all around the city. Leary-Almeida manages the business and is also a hands-on mason herself. Not only that, but she has made it her mission to train other women in the trade. “I spend a lot of time training other women in my business. It’s a great opportunity to pass on more economic freedom to other women and the same kind of success I have been able to have,” she says. Leary-Almeida was herself a recipient of that spirit of paying it forward, as the recipient of the SCE Women’s Scholarship Award while she was a student. Now that Leary-Almeida is helping to make a difference in others’ lives herself, she’s also extending that favor to her own daughter. Together they’re opening a bakery and catering business, The Sweets Plug, on Hartford Avenue in Johnston this spring. Masonry and catering may seem worlds apart, but for Leary-Almeida, it’s all in a creative day’s work. That’s why she chose Liberal Studies as her major. “I like doing a variety of things, and being creative. I took courses in art, photography and ceramics in addition to the core courses, because it’s what I like. I feel like it helped me learn better, and it still does,” she says. But she says her biggest takeaway from her time at PC was learning about – and believing in – herself.